Welcome to the Wacky World of Crazy M! 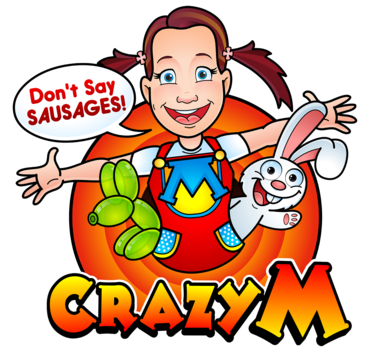 If you're planning a children's party or a promotional event, Crazy M's slapstick humour could be just what you're looking for! Crazy M can cover parties and promotions anywhere in the South! "A big thumbs up for making Jack's party AMAZING. Everyone loved it, including the adults!" "I don't know how you keep 30 four year olds entertained for two hours but you certainly did - best party ever!" Crazy M's up and coming events Please note, this list is not the complete Crazy M diary - please use the contact form to check availability for your preferred date (often more than one booking can be taken for the same day!). For public events, tickets may need to be purchased - please contact the event organisers for more details. 6 June 2019 - New Forest Schools Day - on the road with Rufus!